September 27, 2012 By Katie P.
I was named after my Grandma Kate, born Katherine Irene Murphy. She passed away before I was born, but I’ve always felt a special connection with her. Grandma Kate was named after her aunt, Katherine Murphy-Arnaut, who died unexpectedly at 29 years old. I didn’t think I would learn much about Catherine Aspery, after all, she is my 3rd great grandmother who spent very little of her life in America, was likely very poor, and whose married name was incredibly common: Murphy. After exchanging info with some other Aspery-Murphy descendants and a serendipitous visit to the Pennsylvania State Archives and Library, I was able to make some interesting conclusions (don’t ever underestimate the importance of your 3rd and 4th cousins!). Catherine Aspery was born in Erdington, Shropshire County, United Kingdom May 1844 to Henry Aspery and Sarah Perchase. She was raised in Escomb, Durham County (Northern England) with her six siblings: William, Henry, John, Thomas, Sarah and Phoebe. Catherine married William Murphy around 1872 and they had eight children, six of which I know: William, Harry, John, James, May and Sarah. Her children’s names resemble closely with her siblings’; I wouldn’t be surprised if the two missing children were named Thomas and Phoebe! Her husband, William worked at the ironworks in Witton Park. He had moved there from Ireland in search of work. But, after a significant industrial boom and years of poor working conditions, the Witton Park ironworks had gone into a serious decline and closed by the 1880’s. Catherine and William immigrated to America in 1892 and settled in Sharon, Mercer County, Pennsylvania. Some of Catherine’s siblings had already come to Pennsylvania many years earlier. Their son William arrived in Sharon one year earlier (1891), most likely to arrange a housing situation before the rest of his family arrived. 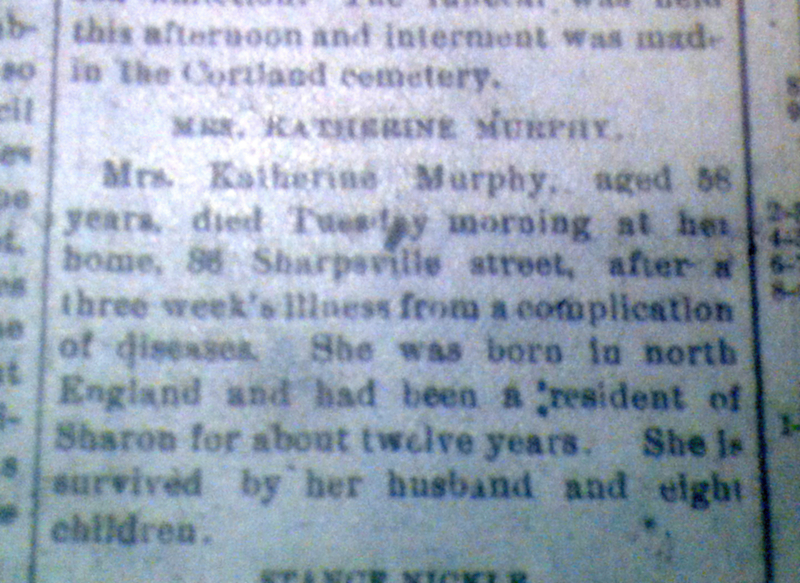 The Murphy family lived at 86 Sharpsville Street. Catherine passed away on 21 January 1902 from “liver troubles,” having been ill for three weeks. She was buried at St. Mary’s Cemetery, a Catholic cemetery managed by the Sacred Heart Church. She left her husband and eight children. I really look forward to finding more about Catherine, her husband, and children. Thats very interesting Kate, you make it very easy for everyone to connect with the past. Thank you for the time you spend researching. ← Catherine Aspery – Solved!